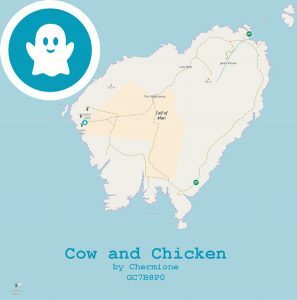 An amazing and unique geocache has been published! You may remember that last year, geocaching.com gave a few lucky geocachers in the world the opportunity to have a virtual geocache published – a geocache type that has been “grandfathered” for several years and is no longer allowed under normal circumstances. We managed to obtain some “insider” information that one had been allocated on the Isle of Man, but further information was not forthcoming, time passed and we began to wonder whether our source was correct. But here it is! And what a super cache it is, well worth the wait. A lot of thought and research has obviously gone into this cache and now we are all winners as we have a new and unique goal to aim for. We don’t know anyone who could have made more of this wonderful opportunity. Take a look at https://coord.info/GC7B8P0 and plan your journey. As well as being a rare cache type, this is also a rarity in that it is a true T5 but accessible to many without special skills. D2/T5 is a rare combination too – we have completed our D/T grid but only have one in that box. And the opportunity to log a virtual cache is increasingly rare – remember there is no box to find, just some questions to answer and a picture to take. But forget the statistics, this will be an interesting voyage of discovery, quite literally. As mentioned on the cache page, some of the history of the lighthouses goes back 200 years but some is within living memory for many of us, the newest lighthouse being opened as recently as 1968. We rather like the phrase “After taking 47 years to reach an agreement…” which reminds us that the island is not known for snap decisions! So pack your picnic, don your walking boots and book your boat. The Calf of Man has so much to offer, not least a couple of traditional caches as well and, if you are lucky, lots of flora and fauna to spot.